It is easy to make new friends as a kid in school, but as an adult it can be more difficult, especially if you move to another city after graduation. As well, as adults our lives quickly become quite hectic as we focus on our careers, perhaps do some travel, manage a household on our own, and even get married and have children. As kids we had lots of free time to hang out with friends, socialize, go out for dinner and drinks, and go to sporting events, and so on. As adults we sometimes wonder if we will ever have “free time” again. And because of that lack of free time, any friendships that we may have typically begin to suffer and dwindle away, simply due to lack of attention. As an adult do you find that you have fewer friends than you use to have? Do you find it difficult to meet new people and make new friends? 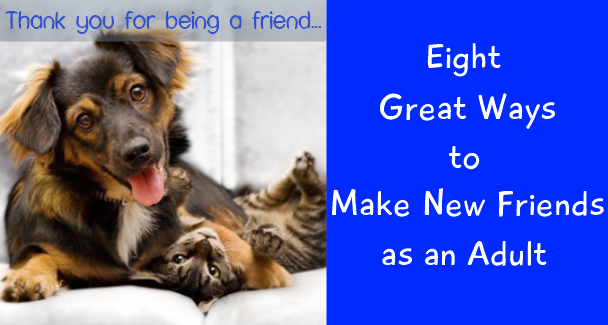 Here are eight great ways to make new friends. Hopefully you will be able to try at least a few of them and meet a couple of nice new people that you would enjoy spending time with. Taking a night school class is the perfect way to meet like minded people and strike up new friendships. Yes, you could take a class that relates to your career, or you could take a fun class such as a gourmet cooking class, wood-working, scrap booking, decorating, etc. Classes typically run for seven to ten weeks which will give you plenty of time to chat with everyone. If you meet a few people that you enjoy, suggest that you get together for coffee or a drink after class. Do you have a local community centre in your neighbourhood? We do, and quite often they have a calendar of events that people can attend. You can head over in the evening and play volleyball, badminton, or even take dance lessons. During the week they organize activities for the 55+ Club. Things such as playing cards, crocheting, quilting, playing chess, etc. Over the past 10 years or so, meetup.com has become extremely popular. People attend networking sessions and business seminars that have been organized via meetup.com. Others attend social gatherings with those that share a common interest. Social gatherings include everything from getting together in someone’s home to play cards, to doing a Pub Crawl, or to simply having a BBQ in a local park. Whatever the event is, you will find that most of the people that attend are there to make new friends, just like you are. If you would love to learn how to run, or already know how, but would like to run with others and make new friends, consider joining the Running Room. They offer group lessons and seminars. And after a good run you can invite the others out for coffee. The Running Room calendar is active year round as well. One of my favourite ways to make new friends is to host a BFPL – Bring a Friend Pot Luck dinner. The way it works is you invite three or four people that you are already friends with and ask each of them to bring a friend and a pot luck dish for everyone to share. Keep it casual and fun. The intent is that they will bring people you do not already know, and hopefully by the end of the day you will have made a few new friends. As an adult volunteering is a great way to make new friends because you and the others that are there already have something in common. Take it slowly and make a point of getting to know some of the other volunteers. Once you feel comfortable, suggest that a few of you get together to go hiking, or some other fun activity. Church socials can be a lot of fun. Sometimes you will meet on a Wednesday afternoon to play cards. Other times you might have Sunday dinner together or do a large family picnic in the summer. Fun events always make it easier to meet people and get to know them better. Of course once you make new friends the next step is to make an effort to stay in touch with them. As a busy person, do not feel pressured to stay in touch with them everyday like you did with the friends you went to school with. Instead, suggest a monthly get together for dinner, coffee, a movie, or whatever you enjoy doing. This gives you something fun to look forward to, and it is a great way to stay in touch with your friends.